Background: Gingival recession in its localized or generalized form is an undesirable condition which results in root exposure. Several different techniques have been described in order to cover the exposed root surface, and increase the dimensions of the keratinized tissue in gingival recession defects. The aim of the present study is to evaluate the result using a bio resorbable membrane for the treatment of human isolated buccal gingival recession. Materials and Methods: Ten patients, i.e. 6 males and 4 females, mean age 34.5 years, with Miller's classification class I or II facial mucogingival defects were selected. A full thickness flap up to the mucogingival junction, followed by a split thickness flap was reflected. This was done so as to cover the membrane at the defect site, at the same time cover the denuded root surface. All parameters were recorded by a single investigator for each surgical site before surgery (baseline), after 3 weeks, 3 months, 6 months and 9 months. Results: The selected sites clinically presented with initial mean recession of 4.4 mm, mean area of recession of 10.5 mm and initial mean keratinized tissue width 4.2 mm. The results of this study had showed a mean coverage of the recession defects by 3.45 mm and a significant gain in keratinized tissue width of 0.8 mm post operatively at nine months. There was also a significant reduction in area of recession. The difference between the base line reading and post operative readings was both clinically and statistically significant. The mean percentage of root coverage was 79.75%. Conclusion: Resorbable membrane is a versatile treatment modality for coverage of isolated buccal gingival recession. Although membrane exposure occurred in four patients, it did not interfere with post operative healing. Several different techniques have been described in order to cover the exposed root surface and increase the dimensions of the keratinized tissue in gingival recession defects. Ideally, the primary aim of these surgical therapies is the complete restoration of the anatomy of the mucogingival complex and the regeneration of the attachment apparatus of the tooth. The traditional periodontal surgical therapy results in formation of long junctional epithelial attachment which is a weak barrier and is prone for recurrence of periodontal pocket and disease activity. Thus, minimal periodontal regeneration is seen following this conventional method of periodontal therapy. To avoid the epithelial down growth, and at the same time to restore the lost structures in totality has lead to the development and experimental use of different techniques and materials. Treatment of compromised aesthetics and dental hypersensitivity due to gingival recession has been attempted with different types of mucogingival surgical procedures such as lateral  and coronally  positioned flaps and free gingival grafts. The aim of the present study is to evaluate the result using a bio resorbable membrane for the treatment of human isolated buccal gingival recession. Ten patients, i.e. 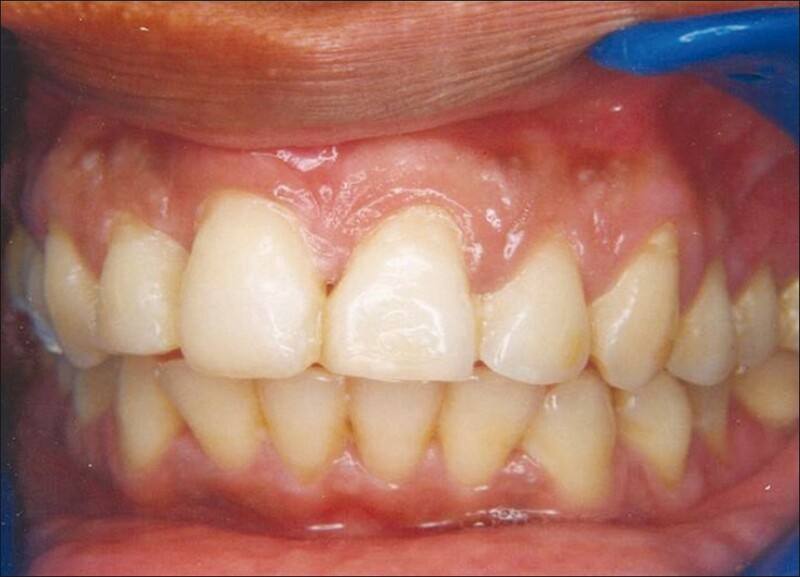 six males and 4 females between age of 20-50 years (mean age 34.5 years) with anterior teeth (7 maxillary canines, 2 maxillary central incisors and one maxillary lateral incisors) gingival defects were included. The study was conducted in department of periodontics, Peoples College of Dental Science, Bhopal. All the subjects went through the routine phase I therapy. Patients were informed about the procedure and informed verbal consent was taken before treatment. All parameters were recorded by a single investigator for each surgical site before surgery (baseline), after 3 weeks, 3 months, 6 months and 9 months. The following clinical criteria were recorded to nearest millimeter using Hu friedy William periodontal probe. Keratinized tissue width (KT) including the free and attached gingiva from the marginal gingiva to mucogingival line. The mucogingival line was established as a point of reference by visual identification of the junction between the keratinized and firmly attached gingiva and the loose mobile alveolar mucosa in all patients. After achieving profound local anesthesia, a sulcular incision was made on the buccal aspect of the involved tooth, using 15C blade. Two oblique vertical incisions were made so that a large trapezoidal combined full and split thickness flap could be raised beyond the muco gingival junction [Figure 2]. The inter dental papillae were preserved for better coverage of the material interproximally. The full thickness flap was limited to 3 to 4 mm beyond the marginal bone crest. The continuous partial thickness flap portion was extended apically into the vestibule, so that the flap could be exactly repositioned as far coronally as possible. The root surface was then planed thoroughly to the bone crest using Gracey curettes # 1 and 2. Root conditioning was done with citric acid using burnishing technique for 3 minutes, (cotton pellets were replaced after 30 seconds intervals) followed by through saline rinse. Resorbable barrier membrane (configuration RW-1, Resolute) was stabilized with gore resolute resorbable sutures at the surgical site to cover the exposed root portion and 3 mm of the surrounding bone [Figure 2]. It was seen that there was sufficient space between the root and the membrane. Flap was taken as coronally as possible in order to avoid any exposure. Care was taken to avoid any tension on the flap. The flap was stabilized coronally with help of sutures tied to brackets which were bonded to two adjacent teeth prior to the surgery. Expanded polytetrafluoroethylene (e-PTFE) non absorbable sutures were used to appose buccal flap to palatal flap by interrupted suturing technique. The vertical incision lines were also approximated as to prevent bone exposure. The periodontal pack was placed. Patients were given a cold compress extraorally to minimize swelling and bleeding. They were prescribed 0.12% chlorhexidine gluconate (Periogard mouth wash) and instructed to rinse gently twice daily for 3 weeks. Tooth brushing activities were discontinued during this time in relation with the surgical site. They were also given antibiotics (amoxicillin, 500 mg, three times daily) and analgesic (ibuprofen 600 mg, twice daily) for 7 days. At the end of 1 st week the periodontal pack was removed, and the area was irrigated with 0.12% chlorhexidine. Sutures and brackets were removed after 2 weeks and patient was advised to brush with a super soft bristle brush (colgate post surgical brush) using modified Stillman method. The data was statistically analyzed using the Student's paired t test. Ten patients were treated. The mean age of patients was 34.5 year (ranging between 20-50 years). There were 6 males and 4 females. Maxillary anterior teeth (7 maxillary canines, 2 maxillary central incisors and one maxillary lateral incisor) were treated. The baseline clinical measurements consisted of three different parameters which included Rec, area of recession, and KT. The postoperative measurements for these parameters were taken at 3 weeks, 3 months, 6 months and 9 months as seen in [Figure 3] showing remarkable coverage. [Table 1] and [Figure 4], [Figure 5] and [Figure 6] summarizes the mean value of recession, area of recession, keratinized tissue width at pre treatment, 3 weeks, 3 months, 6 months and 9 months. A statistical analysis was done by Student's paired t-test. The mean value of recession pre and post operatively was recorded as 4.4 mm and 0.95 mm respectively. The standard deviation (SD) was 0.5164 mm pre- operatively and 1.6406 mm post-operatively. The mean value for area of recession preoperatively was 10.5 mm and post operatively was 2.6 mm. The SD value for area of recession pre-operatively and post operatively was 3.1868 and 4.8120 mm respectively. The mean value of KT pre-operatively and post-operatively was 4.2 mm and 5 mm respectively. The standard deviation preoperatively and postoperatively for keratinized tissue width was 0.6324 and 0.9428 mm respectively, however no change in mean and standard deviation was seen at 2 weeks. 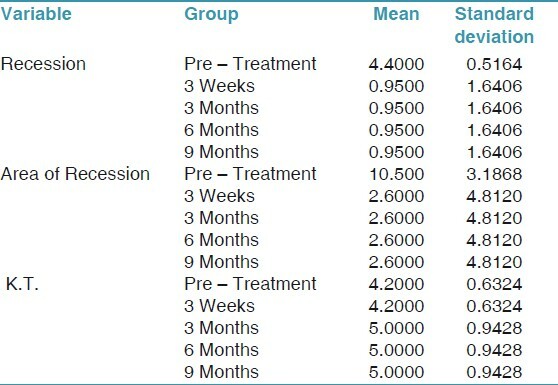 Table 1: Showing changes in recession, area of recession and keratinized tissue mean and standard deviation at 3 weeks, 3 months, 6 months and 9 months. The coverage of roots exposed by recession is one of the primary goals of reconstructive periodontal therapy. Despite the success of mucogingival root coverage procedures, the mode of attachment of grafted tissue to the root has always remained a question. A potential weakness of these procedures could cause the recurrence of treated periodontal pockets. GTR is an alternate approach to root coverage, and results in gain in clinical attachment, and histologically results in new attachment as well. Pini Prato et al., , Cortellini et al.,  Thrombelli et al. have demonstrated the effectiveness of barrier membrane in treatment of human facial gingival recession. Roccuzzo et al. analyzed that there was no marked difference on results between bioresorbable and non resorbable membranes; however the single step surgical procedure was preferable. In this study, bioresorbable membrane was used for the treatment of facial gingival recession defects in 10 patients with mean recession 4.4 mm preoperatively and resulted in 0.9500 mm of gain after 9 months postoperatively. The difference between the base line reading and post operative reading was both clinically and statistically significant. The mean percentage of root coverage was 79.75%. Though there was exposure of membrane in 4 out of 10 patients, immediate postoperatively there were no adverse affects in healing. The exposed barrier was able to act as a "scaffold" for the formation of granulation tissue originating from the defect. The membrane has a porous mesh structure of synthetic bio resorbable glycolide polymer fiber and occlusive membrane of synthetic bioresorbable glycolide and lactide co-polymer. These features could have allowed for granulation tissue to penetrate and integrate with matrix, thus supporting its formation in supra gingival area. These observations support those by Roccuzzo et al. 1966 where recession depth was achieved in sites where matrix barrier has been exposed following surgery. Klinge et al. and Gantes et al. pointed out that initial shrinkage of flap margin in the early healing stages limited the new attachment. 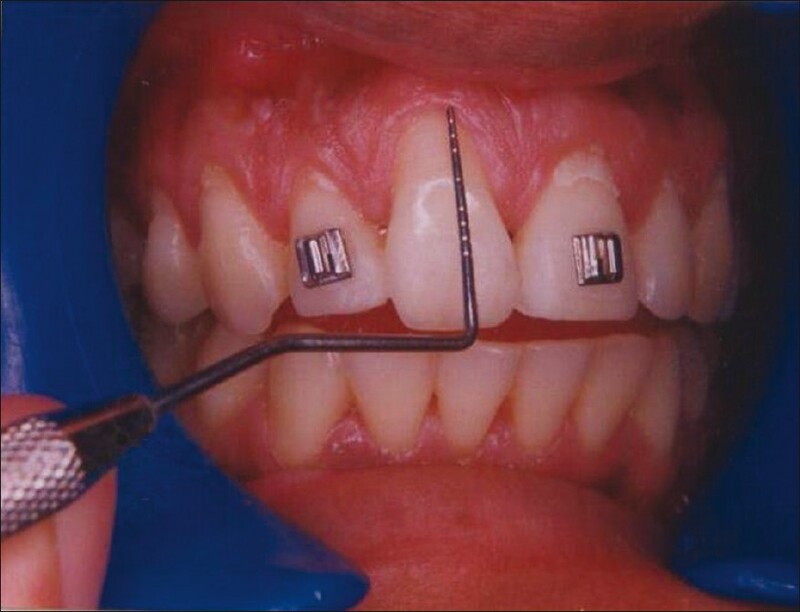 Thus, in this study, an attempt was made to overcome this drawback by placing orthodontic brackets on 2 adjacent teeth next to operative site on to which the coronally positioned flap was stabilized. This prevented the gingiva to recede due to shrinkage during the initial healing period. The brackets were removed 3 weeks postoperatively. Dahlin et al. had pointed out the need to maintain proper timing between the degradation of the membrane and complete periodontal tissue regeneration. It has been seen that coronal migration of periodontal ligament (PDL) cells peaked within first 1 to 2 weeks postoperatively, and their mitotic activity was decreased 3 weeks after surgery. Various types of membranes have been commercially available which include polylactic acid (PLA) membranes, collagen membranes, polyglycolide membrane etc, the resorption time of which varies. The membrane used in this study was bioresorbable membrane which is composed of glycolide polymer and glycolide (15%) lactide (85%) copolymer at the occlusal area. The glycolide and lactide co-polymer at the occlusive membrane makes it more porous due to its organic structure and resorbs earlier as compared to remaining part of the membrane. The mean coverage of recession was significant after 3 weeks postoperatively. This gain in root coverage was stable for 9 months. Also the mean gain in the area of recession remained unchanged till the 9 month recall. This showed that the first two postoperative weeks were very critical in determining the final results. There was also a significant increase in keratinized tissue width which was observed during the intervals of follow up visit at 3 months, 6 month and 9 months, though there was no significant change at 3 rd week [Table 1]. The increment of keratinized tissue width after 3 months, 6 months and 9 months could not be explained as a result of creeping attachment since the level of gingival margin remained stable at all 4 follow up visits. Thus, the explanation possible for the increase in keratinized tissue width is an apical migration of mucogingival junction towards its original location, though the mucogingival line was displaced coronally during the surgery in order to cover the membrane. Hence, this fact confirms to the hypothesis that the location of mucogingival junction is genetically determined. Another possible reason could be that in the process of taking the split thickness incision in the vestibule sulcus to mobilize the tissue for maximum coronal advancement, muscle fibres were severed which would regenerate in the post-operative phase with re-establishment of the fibee bundle, or with scar tissue formation. Either way there would be an apical pull on the tissues due to the re-organization of the muscle fibres in the vestibular sulcus. This also possibly explains the gain in the keratinized tissue. The post-operative healing was generally uneventful, it was observed that the level at which the gingival margin stabilized during the first 3 weeks remained stable at 3 months, 6 months and 9 months recall. In none of the cases, any kind of sloughing or infection was observed. In this study, a significant amount of coverage of recession was seen clinically with gain in width of keratinized tissue as well, which added to its advantage. The results being positive, they renewed hope for further research in the use of this particular material for the coverage of human gingival buccal recession. The results of this study had showed a mean coverage of the recession defects by 3.45 mm, and a significant gain in keratinized tissue width of 0.8 mm, post operatively at nine months. There was also a significant reduction in area of recession. apart from the beneficial results, high cost of the material is the only drawback. 1. Roccuzzo M, Bunino M, Needleman I, Sanz M. Periodontal plastic surgery for treatment of localized gingival recessions: A systematic review. J Clin Periodontol 2002;29(Suppl 3):178-94. 2. Kassab MM, Cohen RE. The etiology and prevalence of gingival recession. J Am Dent Assoc 2003;134:220-5. 3. Loe H, Anerud A, Boysen H. The natural history of periodontal disease in man: Prevalence, severity and extent of gingival recession. J Periodontol 1992;63:489-95. 4. Huang LH, Neiva RE, Wang HL. Factors affecting the outcomes of coronally advanced flap root coverage procedure. J Periodontol 2005;76:1729-34. 5. Trombelli L, Minenna L, Farina R, Scabbia A. Guided tissue regeneration in human gingival recessions: A 10-year follow-up study. J Clin Periodontol 2005;32:16-20. 6. Gottlow J, Nyman S, Karring T, Lindhe J. Treatment of localized gingival recession with coronally displaced flap and citric acid. J Clin Periodontol 1986;13:57-63. 7. Guinard EA, Caffesse RG. Treatment of localized gingival recession part 1 lateral sliding flap. J Periodontol 1978;49:351-6. 8. Guinard EA, Caffesse RG. Treatment of localized gingival recession part III comparison of results obtained from lateral sliding flap and coronally repositioned flap. J Periodontal 1978;49:457-61. 9. Miller PD Jr. A classification of marginal tissue recession. Int J Periodontics Restorative Dent 1985;5:8-13. 10. Pini Prato G, Clauser C, Cortellini P, Tinti C, Vincenzi G, Pagliaro U. Guided tissue regeneration versus mucogingival surgery in the treatment of human buccal recessions. A 4-year follow-up study. J Periodontol 1996;67:1216-23. 11. Prato GP, Clauser C, Magnani C, Cortellini P. Resorbable membrane in the treatment of human buccal recession: A nine-case report. Int J Periodontics Restorative Dent 1995;15:258-67. 12. Cortellini P, Clauser C, Prato GP. Histologic assessment of new attachment following the treatment of a human buccal recession by means of a guided tissue regeneration procedure. J Periodontol 1993;64:387-91. 13. Trombelli L, Scabbia A, Tatakis DN, Checchi L, Calura G. Resorbable barrier and envelope flap surgery in the treatment of human gingival recession defects. 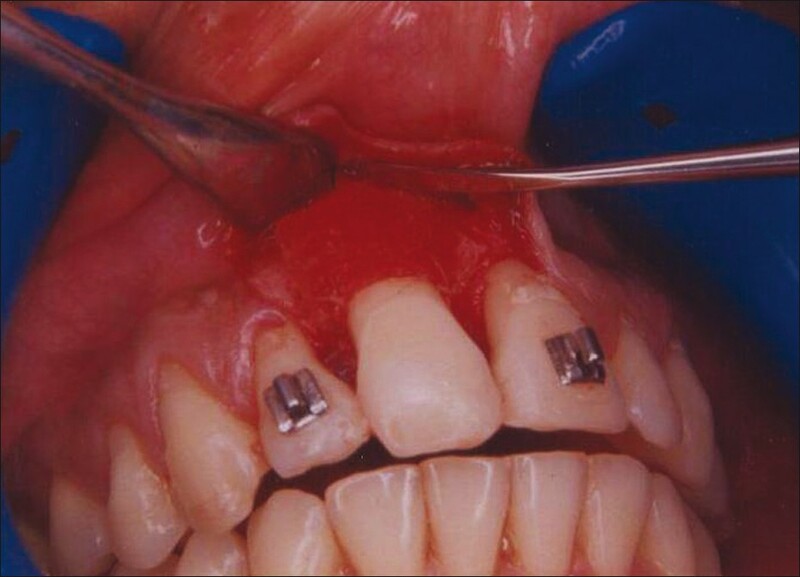 J Clin Periodontol 1998;25:24-9. 14. Roccuzzo M, Lungo M, Corrente G, Gandolfo S. Comparative study of bioresorbable and non resorbable membrane in the treatment of human buccal gingival recessiob. J Periodontol 1996;67:7-14. 15. Klinge B, Nilvéus R, Kiger Rd, Egelberg J. Effect of flap placement and defect size on healing of experimental furcation defects. J Periodontal Res 1981;16:236-48. 16. Gantes B, Martin M, Garrett S, Egelberg J. Treatment of periodontal furcation defects. J Clin Periodontol 1988;15:232-9.